Following Theresa May’s breaking of her word on Tuesday 18 April, the NEC swung into action and had a meeting on Wednesday 19 April. It was a very upbeat and business-like meeting. Everyone was totally focused. A lot of work has already been done – the staff are really up for it. Andy Kerr was in the chair. Jeremy was very enthused and has already hit the campaign trail. He gave details of today’s vote in the House of Commons, with MPs overwhelmingly voting for a General Election. (The election in Gorton will now take place on the same day as the General Election.) Jeremy stressed that most Labour voters would have never understood a vote by Labour to allow a Tory government to continue in office for another 3 years, carrying out vicious austerity policies. He emphasised the importance of getting our key messages across to the public. Jeremy pointed out that the Tories are already on the defensive – May is running scared of any TV debates. Jeremy highlighted his original 10 pledges (see the Labour Party website) and also took the NEC through all of the policies that we have announced over the last two weeks. These have been very well received by the voters. Jeremy highlighted the fact that during the General Election campaign, the media are obliged to give Labour a fair hearing. This will of course not apply to the hostile press, but then they have always opposed Labour because their owners want to keep their hands on their power and money, and therefore totally support the Tories. Jeremy then apologised for having to leave the NEC, but he was hitting the campaign trail in south London where he was attending a key Campaign Function. Having known Jeremy for some 42 years, I am well aware that campaigning and meeting the public is Jeremy’s strong suit. The Tories and their lickspittles in the press and media have a shock coming. No wonder May is fearful of confronting Jeremy in the television spotlight. Jeremy was given a very warm send-off by many NEC members, who emphasised the positives. I stressed that the “experts” are often wrong and will be wrong again. As Rodney Bickerstaffe always used to say to me and Jeremy, an ‘ex’ is an unknown quantity and ‘spurt’ is a drip under pressure. We have excellent and committed staff, the largest party in Western Europe, and an inspiring leader. We will humiliate the doom-mongers and naysayers. Kezia Dugdale emphasised the total support for Jeremy in Scotland. Kezia added that we should have no truck with any talk of a ‘progressive alliance’ with the SNP. Not only does this damage our candidates in Scotland, and indeed also South of the Border, but it is too much of a stretch to label the former Tartan Tories as ‘progressive’- despite the image that Nicola assiduously tries to present. Several trade union reps highlighted the very exciting policies that have been announced recently, particularly the £10 Real Living Wage, large scale council house building, and enhanced rights for part-time workers, e.g. school meal workers. Jeremy thanked the NEC for their enthusiastic support and confirmed that he had already met with TULO officers to discuss many of the issues raised by the trade union reps. As he was going out of the door, Jeremy reminded us all that the final registration day is 22nd May. We need to make sure that all of our supporters, especially the young, are registered to vote. Procedures for the selection of candidates for the General Election. Sitting Labour MPs: All those intending to stand again will be deemed to be re-selected, on the basis of the NEC’s endorsement. Seats where Labour MP is retiring: Applications will open on Friday 21st April and close at noon on Sunday 23rd April. The NEC Officers will conduct interviews and impose a candidate. As a minimum, all seats that were held by women will be selected on the basis of All Women Shortlists. Non-Labour seats: Candidates who stood in the 2015 election (and who remain in compliance) will be contacted by their regional office, requesting that they seek selection in the same seat. 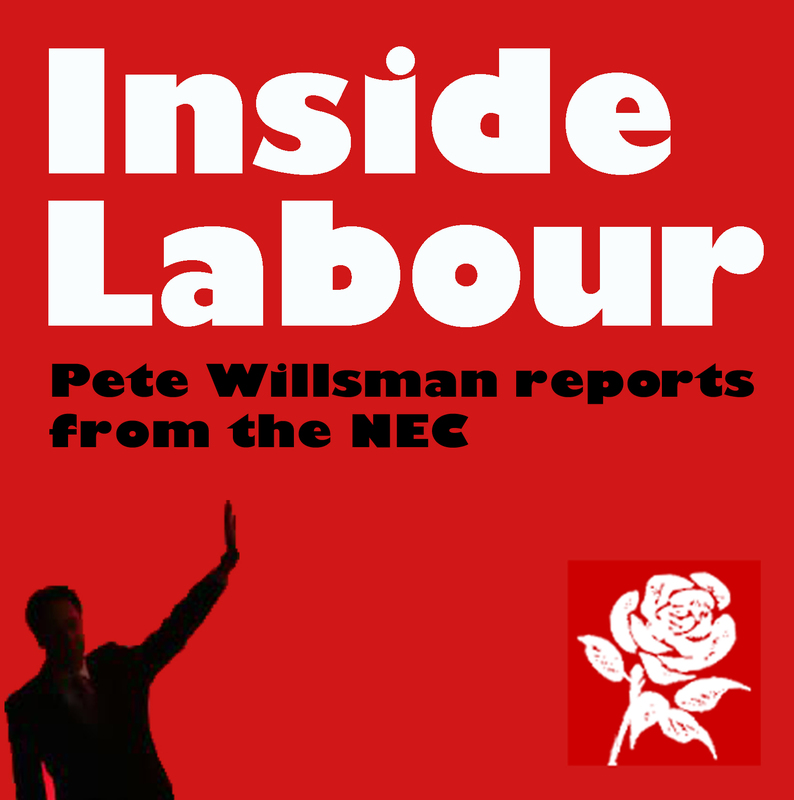 The non-Labour seats will be selected via panels (two NEC members and one regional board member). The panels will consider CVs and applications of all candidates on a seat-by-seat basis and make a determination of the best candidate for each seat. 2015 General Election candidates will be considered first for each seat. Then any new candidates who have expressed a preference for that particular seat will be considered where there are still vacancies. The panels will make these decisions between Sunday 30th April and Tuesday 2nd May. The panels may make a majority decision and their decisions will be final and binding on all parties. The NEC will be formally asked to endorse all of the decisions by the panels. Qualifications: Any prospective candidates must have joined our party on or before 18th April 2016 to be eligible for consideration. In addition, (except in exceptional circumstances) every applicant must be a member of a trade union affiliated to the TUC, or be a member of a what is considered to be a bona fide trade union. They must contribute to the political fund of that trade union. There was then a lengthy debate about the issues raised in this document. I questioned whether the NEC should automatically endorse an MP who only a few hours ago had made very negative comments about our elected Leader. There was also the case of the MP who has been referred to the National Constitutional Committee (NCC) by the NEC on the basis of quite serious charges. In regard to the latter, our officers were consulted. They referred to possible legal implications and the matter will be considered further by the General Secretary and NEC Officers. The issue of some involvement by members/CLPs in selections was pressed by CLP reps during the long discussion on the paper. The point that the paper did not sufficiently address the need for greater BAME representation was taken on board and the document will be amended accordingly. Finally, the Chair put the whole document to the NEC. It was carried by an overwhelming majority. This document proposed a temporary extension of the provisional membership period for new members. This was agreed. In accordance with the Rule Book, during the General Election campaign all CLP meetings are temporarily suspended. Members may still meet to plan/arrange campaigning. The document also made the very positive proposal that the closing date for notification of Annual Conference delegates, the submission of Rule Changes, and nominations for National Committees will be extended from 23rd June to 7th July. This was agreed. The investigations/appeals currently being undertaken will be postponed and resumed after the General Election. The Manifesto Team will meet with many party groups, including trade unions, socialist societies, MPs, MEPs, councillors, ALC, LGA, Labour Lords, BAME Labour, LGBT Labour, Labour Students, Disability Labour, Labour International, Labour Women’s Network, and meet with reps from the Scottish Labour Party, Welsh Labour Party, and Labour Northern Island. There will also be meetings with our sister party, the Co-operative Party. National Policy Forum (NPF) Engagement: It was agreed that NPF reps must be closely involved in the Manifesto process. There will be conference calls of Policy Commission members, also an NPF engagement event to discuss the full NPF’s view on the challenges and priorities to be addressed. Through the NPF’s chair and vice-chairs there will be an input into the Clause V meeting. Clause V Meeting: This Rule Book meeting signs off the Manifesto. It is chaired by the Leader and is made up of the following: the full NEC, the full Shadow Cabinet, the Parliamentary Committee of the PLP, the 8 trade union members of the TULO Contact Group, the leaders of the Scottish and Welsh Labour Parties, and the chair and 3 vice-chair of the NPF. Steve Howell and Seumas Milne (from The Leaders Office) introduced a discussion on the development of the Manifesto. They took the NEC through each of Labour’s recent policy pledges. These policies have met with widespread support. It was noted that many small businesses had responded enthusiastically to the proposal that big corporations should be prevented from deliberately paying their debts to small companies as late as possible. Further major policy announcements are on the way in the next few days, especially key policies on the NHS and housing. The officers outlined our core strategy for the economy, including increasing productivity, increasing investment with a National Investment Bank. As part of this, we will introduce enhanced rights for employees. We will focus on our positive policies, for the many rather than for the few. Nevertheless, we will highlight the extremist record of the Tory government – austerity, increased homelessness, cuts to benefits, falling wages, increased vulnerability of workers (e.g. zero-hour contracts), preparing for the full privatisation of the NHS, re-introducing grammar schools for the benefit of the well-off and to the detriment of those just about managing, behaving like a puppet for the trigger-happy Trump, and increasing complicity in the violation of human rights in order to benefit the sale of weapons of destruction. There will also be publicity focusing on May’s lack of leadership, not only has she broken several promises and commitments but she is running scared of debating with our Jeremy. NEC members then made their own contributions and suggestions. I pointed out that the public are often more impressed by things in their daily life rather than leaflets. For example, under the Tories there is always a major increase in people sleeping in doorways – of course, one former Tory cabinet member callously described the homeless as “what you step over when you come out of the opera”. I pointed out that under Labour governments in the 1960s there were very few homeless, no pawn shops, and in the 1950s no betting shops either. People had proper jobs with a career structure – certainly not a zero-hours world. I also emphasised that a major reason for May running for cover is that a huge scandal is breaking out over the Tory’s dodgy election claims in 2015. May is well aware that this will massively damage the Tory party. Cath Speight added emphasis on my point by reminding everyone that the day after May announced the General Election it was revealed that no less than 30 Tory MPs are being investigated by the police. It was pointed out that overall living standards are about to fall, and that this is a major factor in May’s decision to break her repeated promise. Finally, it was agreed that our campaign must have a consistent message, including a very clear Labour position in relation to the Brexit negotiations and the aftermath. Finally, Simon Jackson, Senior Officer for Policy and Research, brought everything together by setting out full details of the timetable for the Manifesto process, together with giving more details for the arrangements of the Clause V meeting. Some of us felt it would be appropriate to end the meeting with a rousing rendition of the Red Flag, but others said there wasn’t time because they had to join Jeremy on the campaign trail. Posted in: Activism, CLPD, Labour, Politics, Uncategorized. Thanks for the report. I have to say, though, that the selection process for MPs sounds horrible. I know that we don’t have time to reopen the whole reselection battle, but can’t we argue against having the NEC acting as gate-keeper in preparing short-lists? And am I correct in understanding that the NEC will simply choose a candidate for all non-Labour seats, without any involvement of the CLP at all? Surely the Left shouldn’t accept that the panel’s decision is “final and binding on all parties”? I understand that there may not be time to mobilise against such measures, but you say that the paper “was carried by an overwhelming majority”. Does that in include yourself and the other left-wing CLP reps? I’d have hoped that you would oppose this. Finally, do you have any data to show that Jeremy’s recent policies “have been very well received by the voters”? It may be the case, but it isn’t self-evidnetly so. And, while we should certainly do our best to win, we should not allow ourselves hubris when dismissing the nay-sayers. If Labour does lose (which certainly isn’t impossible) then this sort of attitude will leave the Left discredited. Looking more closely, I see that all candidates will be imposed by the NEC. The reason given is that there would not be time to organise CLP selection processes. However, this makes little sense to me. As things now stand, the NEC will essentially have to select all candidates (except incumbants), which will be a massive ammount of work for them. On the other hand, the process of organising CLP selection processes would have to be done only by individual CLPs and the work would therefore be much more distributed. If time is truly of the essence, then the NEC could give up its usual right to choose the short-list and simply allow open nominations. I realise that there may be flaws in such a rushed process which could disenfranchise some members, but as things tand now, all members will be disenfranchised. This is an absurdly undemocratic process, and yet I just received an email from Ann Black defending it. Did any of the left-wing CLP reps on the NEC vote against this procedure? Surely the CLPD members, at least, should have kicked up a fuss. Given the current makeup of the NEC, I am also very concerned about who will be selected. Presumeably it will not be anyone from the Left and we will have yet another parliament in which the PLP is grossly unrepresentative of the views of the membership. Agreed, but the selection will be by panels drawn from the NEC which should give the left some influence. The position is worse in Wales, where all selections will be made by the three officers of the Welsh Executive. How much, though? The Left doesn’t have a majority on the NEC. Snap elections happen–they are a fact of life. How can Labour possibly justify not having a process in place for that eventuality? Right wing majority not enough to rig all panels, I fancy. Agree other point. What’s happening with that clown Danczuk who amazingly remains suspended ‘pending investigation’ after two years. Why has the Star Chamber taken so ridiculously long to make a decision, and in the absence of one are we having a new selection and candidate in Rochdale (please)? Does this apply to Keith Vaz too? We should get the point over that we are going to transform society but do it with fun too – need humour in this election! For example Labour could commit to giving Greece billions in aid (political solidarity) so people have basic foods and medicines (and feck EC rules) and I imagine Jeremy flies over and the Elgin Marbles are on the plane too and the Syrizia leader thanks JC by taking him for a meal but gets there before 7.00p as it’s 2 for one! Tight b’stard! Labour could also float a Big Idea as well as the democratic public ownership of rail we could look at free public transport on the buses (run by local councils). As usual, thanks to Peter for writing this report. “Jeremy pointed out that the Tories are already on the defensive”. Are they? “Jeremy … took the NEC through all of the policies that we have announced over the last two weeks.” Last two weeks! Free school meals is good but what about the fragmentation and privatisation of our school system? Micro policies will not solve macro problems. “The Tories and their lickspittles…”. Can we discuss things in a way that might not be immediately repellent to people in the centre who might be persuadable? “We will humiliate the doom-mongers and naysayers.” Wait a bit for that perhaps. “We need to make sure that all of our supporters, especially the young, are registered to vote.” Yes, very important. “Procedures for the selection of candidates for the General Election … I questioned whether the NEC should automatically endorse an MP who only a few hours ago had made very negative comments about our elected Leader.” Quite right too. John Woodcock launched his public campaign by stating that he could never vote for the party leader as prime minister. Manifesto. “It was agreed that NPF reps must be closely involved in the Manifesto process. There will be conference calls of Policy Commission members, also an NPF engagement event to discuss the full NPF’s view on the challenges and priorities to be addressed.” How does any of that work while CLP meetings are temporarily suspended? Sadly, the Policy Commission procedures are not taken seriously by most Party members. I think it is probably true that the majority of them are not even aware of those procedures. “… we will highlight the extremist record of the Tory government –re-introducing grammar schools for the benefit of the well-off and to the detriment of those just about managing”. But why won’t Labour oppose grammar schools outright rather than just opposing new ones? This was exactly the situation in the Blair years. “I pointed out that under Labour governments in the 1960s there were very few homeless”. I would be careful about this sort of claim. 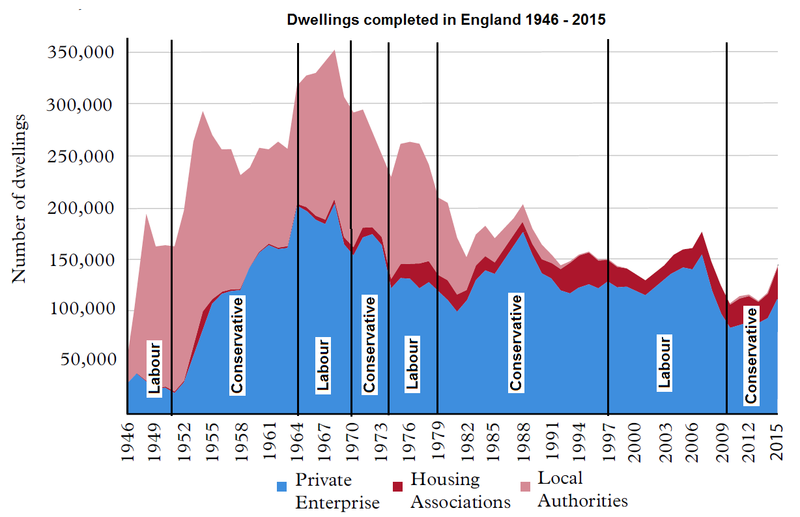 The graph below shows historical trends which shows both high rates of house building for Labour and Conservative in the decades following WWII followed by much lower rates for governments of both stripes. Cathy Come home came out in 1966 and Shelter was founded in the same year. “… it was agreed that our campaign must have a consistent message, including a very clear Labour position in relation to the Brexit negotiations and the aftermath.” I look forward to learning about that very clear position. DP,as you know,CLPD has put together a lot of NPF response stuff.All of this has already gone to ‘our’ 35 NPF comrades, for them to draw on when responding to the Manifesto Process.We have been at this game for a long time.That’s why,for example, we opposed Watson for Dep.Leader,whereas you were led up the garden-I am never going to let you forget that DP!! Peter, you can remind me of what you want as often as you like. For my part when I hear things that seem to me to be questionable I will still question them. That is fundamental to my view of open and honest politics. And when it comes to past choices let’s not forget that you supported Angela Eagle for Deputy and she wasn’t slow in coming forward to try to dump Jeremy Corbyn. Let’s face it the choices for Deputy Leader were all awful and we had different views as to who was the least awful. I don’t think that there is nothing to crow about. You have only chosen to make an oblique comment about my response and have not responded to any of my specific points e.g. about Labour’s housing record. I would be interested in your views on that and the other points (some of which expressed agreement with you). DP,you still don’t get it!! !Watson and Spellar are the Left’s most implacable enemies.They are working against us EVERY minute of the day(ask Len McCluskey).Angela E is relatively harmless.It is a fundamental error to vote for your greatest enemy.Until you grasp that point I will keep on at you.It’s like Trotsky in Mexico voting for Stalin!!! Re the manifesto, I was somewhat disturbed to receive the e-mail from JC today asking for ideas. All very democratic, but isn’t this a bit late in the day? The “consultation” process was also shockingly shallow. It consisted of selecting which topics Labour should focus on in its manifesto. In reality, it needs to have policy on all of those topics. There was a little bit of space for you to write more detailed comments, but as usual this felt quite superficial and I have the distinct suspicion that I am throwing my thoughts into a black hole, never to be seen again. Maybe that explains why the Tories have hit 50% of the vote in the latest poll. Surely no one believes the rubbish Jeremy Corbyn talks about making the rich pay. This is 2017 mate, not 1917. SR,in another poll Labour was gaining.Don’t obsess with polls,they are pretty useless-ask Clinton and Cameron.Get out on the doorstep and stop wingeing. Have you seen this mornings results? They make grim reading for Labour supporters. What is plan B? PR,it was only Tues we knew GE is June and not 2020!! CM,the consultation was an early stage in a 4 year process.It was a bit shallow.CLPD was preparing a 15 page ‘model’ response,useing some stuff from LFs.This is on hold,but has gone to ‘our’ reps.on NPF to use in their responses to Manifesto Process. I’m a bit delayed in replying, but somehow I missed your response. My point wasn’t about the 4 year process which we’d been writing responses for prior to the election being called. Rather, it was about the email I received from Corbyn several weeks ago asking party members for input into the manifesto. This brought me to a truly pointless online form where I was asked to choose which broad policy topics were most important. I really didn’t see the point in this, because a decent manifesto will need to feature policy on all of them. The most this opinion poll would be useful for would be choosing which issues to focus on when campaigning, but that isn’t really a part of the manifesto process. The whole exercise felt like an attempt to appear internally democratic without having to actually do the work to make it democratic. Given the time constraints, maybe the process couldn’t be democratised, but in that case there was no point in acting like it could. I am glad to hear that the left NPF reps will be using the policy responses from LF. There were some very good proposals in those (if I do say so myself, seeing as I wrote one of them). Hopefully one or two of the more ambitious proposals can make it into the manifesto. What we’ve been hearing so far this election, while not neoliberal, hasn’t been especially left-wing. You mean it was all just a con? Seriously, did anyone really believe the labour party, even under Corbyn, would let the people write their manifesto?